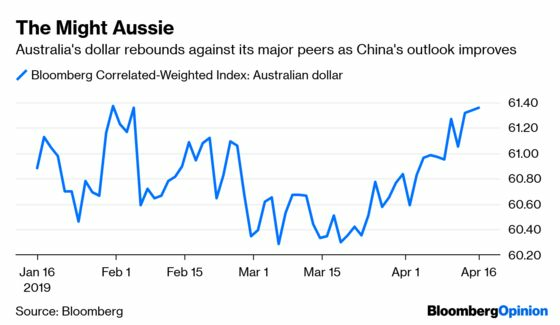 (Bloomberg Opinion) -- There’s been a lot of talk lately about how the global currency market has become stuck in a tight range, with volatility collapsing and no clear trends emerging. Judging by the performance of the dollar, this is no time to be complacent. The Bloomberg Dollar Spot Index rallied on Tuesday despite a disappointing report from the Federal Reserve on March industrial production and capacity utilization. 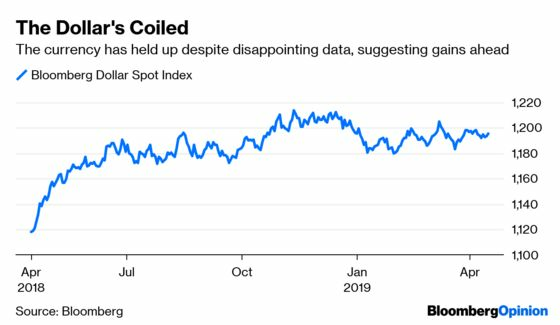 And that’s the point: the dollar has shown remarkable resilience in recent weeks, holding its value even as incoming data has fallen short of expectations by the greatest degree since mid-2017, as measured by Citigroup Inc.’s economic surprise indexes. That marks a break from the recent past, when the dollar tended to move in the same direction as the surprise index. The other thing to note is that the market is more bearish on the dollar than any time in the past year, based on the options market. Hedge funds and other large speculators are paying more to protect against a decline in the greenback than they are for calls versus the euro and its other major peers, according to Bloomberg News’s Todd White. What that means is any bit of good economic news is likely to spur a reversal of those bets, adding to the upward pressure on the dollar. A rising dollar isn’t necessarily a good thing for markets. The big sell-off in stocks in the fourth quarter was partly triggered by the U.S. currency, which strengthened as the Fed doubled down on its hawkish rhetoric. Although equities have largely recovered, investors need to keep a close eye on the dollar. S&P Global Ratings figures that 30 percent of the revenue of S&P 500 companies comes from outside the U.S. Jodie Gunzberg, managing director and head of U.S. equities at S&P Dow Jones Indices, calculated that the S&P 500 rises 3.7 times more from a falling dollar than a rising one. So, all else being equal, a strong dollar should be a drag on stocks. The dollar has also received support from higher yields in the bond market, which has cut the odds on a rate cut by the Fed this year to about 40 percent from almost 80 percent just a few weeks ago. Yields on the benchmark 10-year Treasury note rose as high as 2.59 percent on Tuesday, up from this year’s low of 2.34 percent just three weeks ago. Yields are back to where they were when the Fed made its surprising dovish policy shift on March 20. The jump in yields is generally tied to the notion that the economy isn’t as soft as first believed, and that a recession isn’t imminent, or at least not in the cards for this year. There’s also another development that could put upward pressure on yields: the declining share of purchases by investors outside the U.S. The Treasury Department said late Monday that foreign holdings of U.S. government debt rose by $50.6 billion to a record $6.385 trillion in February. 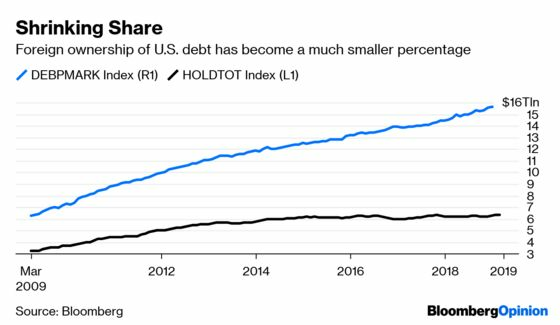 But looked at another way, foreigners own just 40.2 percent of the $15.9 trillion in marketable U.S. debt outstanding, down from 43.1 percent at the end of 2016, 46.7 percent five years ago and 51.3 percent a decade ago. This means the U.S. must rely more on domestic investors to fund a ballooning budget deficit and debt sales forecast to exceed $1 trillion this year alone. “The market can spend some time consolidating near current levels over the short-term, but the medium-term setup continues to point to a trend to higher yields into late-spring/summer,” strategists at JPMorgan Chase & Co. wrote in a research note. Rising yields are also no friend to equities, as we saw late last year. Even so, stocks managed to eke out a small gain Tuesday as the strategists at Cantor Fitzgerald said current yields are “still low enough to lend support to risk assets.” That’s probably true, considering that 10-year yields above 3.20 percent in October and November were a major catalyst of the sell-off in stocks. So, with earnings growth generally flat to lower and the economy decelerating, what exactly is priced into stocks following the 16 percent rise in the S&P 500 this year, and with the benchmark less than 1 percent from its record high? The strategists at LPL Financial and Strategis Research Partners put out a joint report Monday saying that current equity valuations take into account narrowing corporate profit margins and a sustained period of subpar economic growth. “We’ve heard calls for lower profit margins for several years now,” John Lynch, the chief investment strategist for LPL Financial, wrote in a research note Tuesday. 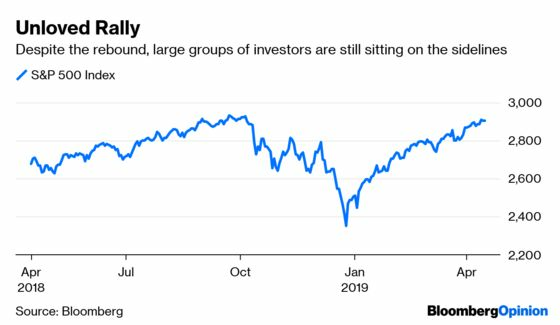 “Those calls will be right at some point, but the market seems to be quite confident that time has come, suggesting the potential for a positive surprise.” And that surprise could be met with a strong rally, judging by various measures of positioning in equities by investors. According to Credit Suisse’s prime brokerage arm, hedge funds’s gross exposure to U.S. equities is the lowest since the middle of last year relative to global allocations. "There are huge pools of money sitting on the sidelines," BlackRock Chief Executive Larry Fink said a conference call Tuesday to discuss the firm’s results. Could the gold market be sensing that better times are ahead and investors will have less need for haven assets as they transition into riskier assets such as stocks? Whatever the reason, it’s notable that gold prices have dropped to their lowest this year, falling to as low as $1,273 an ounce on Tuesday. In fact, precious metals are having a tough time this year generally, with the Bloomberg Precious Metals Subindex falling 2.13 percent. The gauge is down 6.37 percent since late February, while the broad Bloomberg Commodity Index is up 0.35 percent in the same period. And for those who study past trading patterns to help forecast what’s ahead, the outlook for gold isn’t so hot. 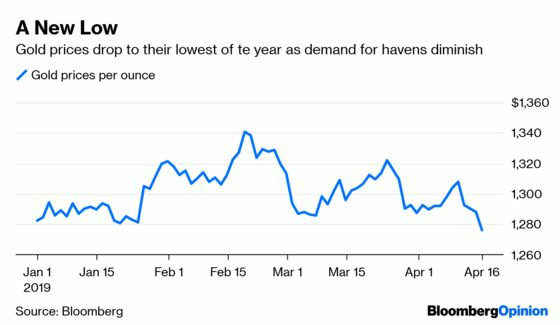 Gold has been trading below its 100-day moving average since Monday, a typically bearish signal that could suggest the metal will fall further after stretching out of its recent trading range, according to Bloomberg News’s Rupert Rowling and Justina Vasquez. There’s also a tie in to the dollar and rising bond yields. Since many commodities such as gold are traded in dollars, a stronger greenback naturally makes owning those raw materials more expensive, tending to damp demand. Also, gold pays no interest, making it less attractive in an environment of rising yields. For proof that investors are starting to believe the evidence suggesting that China’s economy is strengthening, look no further than Goldman Sachs. Presumably in response to investor inquiries, the firm on Tuesday published a research report offering ways investors might profit from the rebound. The firm recommends going long Australia’s dollar versus the New Zealand dollar, the Canadian dollar or the South African rand, according to Bloomberg News’s Susanne Barton. Those crosses provide optimal exposure to Chinese growth with low sensitivity to commodity prices, risk sentiment or the risk inherent in the yuan from the ongoing U.S.-China trade talks. Recent reports on credit growth and consumption bolster the case that China’s economy is improving, and industrial production and retail sales data slated for release Wednesday may add to the bullish case, Barton reports. Another believer is JPMorgan. The firm’s economists wrote in a report Monday that they expect China’s economy to have picked up in the first quarter, expanding at a 6.4 percent sequential rate. That’s better than the 6.1 percent median estimate of economists surveyed by Bloomberg.